Myanmar is quickly becoming a top destination in South-East Asia. There’s something a little more special about a country that only reopened its borders in 2008, leaving sights almost untouched, and barely a McDonald’s sign. But what’s it like for a solo female traveler to spend 48 hours in Yangon? When I told my friends that I was going to be in Yangon for two days on my own, some were concerned. It is true that there are some places you shouldn’t go, but traveling solo in the country was one of the best parts of my experience. I arrived early Thursday morning from Singapore, where I had obtained my visa from the Myanmar Embassy (I was a resident in Singapore at the time). The visa process wasn’t straightforward, so you should leave yourself plenty of time to sort it out. The currency of Myanmar is still only available upon arrival, but there are many currency exchange booths in the airport (most prefer US$). After acquiring a taxi voucher I was on my way to the hostel. At around £10 per night, hostels in Myanmar aren’t the cheapest, and credit cards often don’t work. At my first hostel, I asked the owner about the high prices and he explained that they reflect the fact that government officials can choose how much tax to request from owners on a random basis. I’d recommend talking to local people like hostel owners, as they can offer unique insights into the local culture and best spots to visit. Out of all of the South East Asian countries I’ve visited, Myanmar’s internet connection is the worst… but this is perhaps a blessing in disguise, as it means you have to socialize. I rose to the challenge and dived straight in. If you are wondering what to talk to total strangers about, the answer is food. Everybody loves trying new places to eat, and passing their recommendations on. I was recommended a lunch spot down the road from my hostel, so off I went for lunch on my own. It was a local place, a small step up from street food, with some tables and chairs inside. They had a questionable English translation of the menu, so I ordered randomly. I felt totally at ease as a young woman eating on her own, and everything I ordered was delicious. Back at the hostel people were milling around. I overheard a discussion about a great ice-cream place, so how could I not join in? I asked where it was and suddenly found myself with two friends showing me around the city. I fell in love with Myanmar while exploring Yangon. The people were kind, and they seemed happy and inquisitive about us. We saw the Bogyoke Aung San Market, the Town Hall, China Town and the riverfront, before returning to the hostel. The streets are easy to navigate, but full to bursting with vendors and commuters. The buildings are all so beautiful, yet completely run down. Behind years of neglect you can see what would have once been a gorgeous city. If you are wondering what to talk to total strangers about, the answer is food. Everybody loves trying new places to eat, and passing their recommendations on. That evening a few of us went to Vista Bar, a rooftop bar with a view over the golden Shwedagon Pagoda. We made plans for the next day to visit the Kyaiktiyo Pagoda (the Golden Rock). This is about 2-3 hours from Yangon, followed by a long, uncomfortable truck ride up to the top of the hill where the rock is. Our hostel owner was extremely helpful and gave us clear instructions on how to get a local bus there and back. It was a great day. The setting is beautiful, out in the hills, and the rock is, well…golden. Female travelers be warned: we are not allowed in the most sacred area, next to the rock. 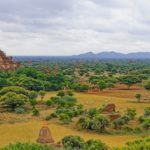 Myanmar is somewhere you should visit while the people still welcome travellers with huge smiles and the advertising is still unrecognisable to the Western eye. Even if you’re travelling solo, go to Myanmar, because I guarantee once you get there, you won’t alone any more!